Ambassador Fahmy of Egypt (11th from left) poses with other ambassadors. The reception was attended by many important guests from the government and various other segments of Korean society. Among them were Deputy Minister of Ministry of Foreign Affairs Sahng Ki Lee, Chairman Rep. Lee Ju Young of Africa New Era Forum at the National Assembly and CEO James Jeon of SK Plasma. Attendance from the diplomatic community was very large and included Ambasadors Mamadou Gueye Faye of Senegal, Difie Agyarko Kusi of Ghana, Albino Malungo of Angola, Emma-Francoise Isumbingabo of Rwanda, Mohamed Abdelaal of Sudan, Bader Mohammad Al-Awadi of Kuwait, Antoine Azzam of Lebanon, Adel Mohammad Adaileh of Jordan and Nozuko Gloria Bam of South Africa. 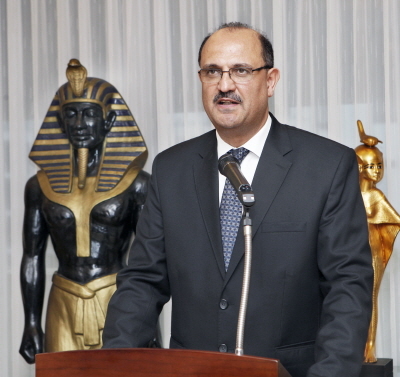 Ambassador Fahmy of Egypt delivers a welcoming speech to the guests. It gives me great pleasure to welcome you all today in the house of Egypt in the great city of Seoul to celebrate a very special occasion, the 66th anniversary of the Egyptian revolution, a landmark event that made a profound impact on: local, regional and global levels. While historians are still conducting rich debates about the many aspects and contributions of the Egyptian revolution, there seems to be little or no doubt about the important role it played in; inspiring the struggle for independence from colonial powers among all freedom loving peoples, in asserting the common future and political identity among African nations, as well as in inspiring Arab nationalism. However, today’s world is different than it was 66 years ago with new challenges facing developing nations, central among them is the challenge to achieve economic development and to integrate into the global economy while securing social , political and human rights for all. In the same spirit of the Egyptian revolution that took place 66 years ago, Egyptians continued on its path and rose again recently in two consecutive revolutions on 25 January 2011, and on 30 June 2013 to correct course and to lay the ground for the achievement of social justice and economic development for all. Egyptians under the leadership of President Abdel Fattah El Sisi have been embarking on an ambitious economic program to transform Egypt into a fully-fledged world class dynamic economy, managing in a short period of time to raise economic growth from 1.8% annually to 5,5% . Such goals cannot be achieved without strong and reliable partners like the Republic of Korea. President El Sisi visited Korea in March 2016 and was extremely impressed and inspired by the Korean model of development and its great achievements. President El Sisi was determined since then to forge a strong partnership with the ROK that would serve the interests of both nations. Many high-level visits and exchanges have been taking place since then in various areas of cooperation, and many Korean companies are investing in Egypt, prominent among them are; Samsung Electronics, LG Electronics, Hyundai Motor, and Kia Motor., while others are working in mega projects in Egypt such as Daewoo E & C, GS E & C, Ares Global and Korea Telecom. We aspire for much more and are looking forward for President Moon Jae-in to visit Egypt in the near future to take our unique and strong partnership to higher levels. In this regard, Egypt would also like to congratulate the ROK and its leadership for its visionary and skillful efforts towards achieving peace and prosperity in the Korean Peninsula and we look forward for the successful completion of those efforts. Finally, within the spirit of the founding principles of the Egyptian revolution, Egypt looks forward to continue and expand cooperation with the ROK on various economic and political regional files in the Middle East as well as in other areas of common interest around the world. As Egypt is getting ready to assume the Presidency of the African Union in January 2019 we also look forward to cooperating with the ROK to enhance the future economic and political outlook for the African continent, in fulfilling the vision laid out by African leaders in its 2063 Development Agenda, especially as Africa moves more confidently and strongly towards economic integration within the context of the newly signed Continental Free Trade Area. I thank your all for your kind presence and wish you all the best.